The University of California Berkeley’s College and Career Academy Support Network (CCASN) is pleased to welcome Dr. Tameka McGlawn as it’s new Executive Director. Dr. McGlawn brings extensive educational experiences and strong leadership skills to the CCASN team. Dr. McGlawn has provided a servant and transformational leadership approach to urban learning communities for nearly twenty-five years. Having served at every institutional level (K-20), in a myriad of settings and professional roles, Dr. McGlawn offers a unique perspective on student-centered assets and achievement, leadership optimization, equity-based outcomes and intersectionality. Her actionable research interests, where she has served and facilitated professional development, learning and capacity building includes, strategic reform implementation, systemic mechanisms of accountability, culturally responsive pedagogy and leadership, building network-community alliances through innovative collective impact initiatives and Design-Based Implementation Research and Improvement Science. Dr. McGlawn is a proud graduate of both the CSU San Diego’s Community Based Block Multicultural & Social Justice Master’s Program, and the Rossier School of Education at the University of Southern California where she earned her doctorate in Educational Leadership. She also holds credentials in Administrative Services and Pupil Personnel Services. An effective consensus builder and action-oriented researcher, Dr. McGlawn brings an ideal synthesis of research savviness, practical application and a deep devotion to increased equity and economic opportunities for all students, their families and communities. Dr. McGlawn graciously serves as a Board Member for the Buck Institute for Education, is intrigued to be a Deeper Learning Equity Fellow and is honored to be a Member of the University of California Office of the President’s UC Curriculum Integration Advisory Council. 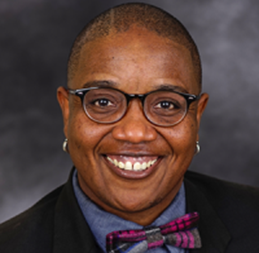 Prior to joining CCASN, Dr. McGlawn most recently served as Director of Equity and Impact at ConnectEd: The California Center for College and Career (ConnectEd). While serving at ConnectEd, she was deeply committed to measuring impact and advancing equity in California’s expanding College and Career regional systems and also supported learning communities, district systems, schools, and pathways in assessing quality and the implementation fidelity of the Linked Learning approach. During her tenure, she produced a range of research-based actionable strategies that emerged from leading the District Initiative Data Advisory Committee (DIDAC) to elevate processes, protocols and platforms to strengthen effective data utilization, assessment of Linked Learning implementation quality, progress metrics, sustainable outcomes and informative impact results. In addition, Dr. McGlawn demonstrated consistent leadership, she served consecutive terms as Co-Chair of the Linked Learning Equity, Access and Choice Advisory Committee (EACAC), a collaborative effort of nearly 25 institutions and organizations across California, created to bring strong, research based and effective systemic strategies to operationalize how districts and schools could ensure equity, access and choice for all students. Considered a seasoned collaborator and evidence-based strategist, Dr. McGlawn also previously served as the Senior Associate for Linked Learning at The Education Trust-West, where she le assessments of Linked Learning implementation, with a strong focus on the quality of curriculum and instruction delivered through Linked Learning pathways, as well as equitable systemic district access and improved outcomes for students. Earlier in her career, she served as the Instructional Dean of Students a Construction Technology Academy at the Kearny High Educational Complex where she was instrumental in the development of their data-driven instructional Leadership team. She also served as an In-School Counselor at the School of International Business. Dr. McGlawn in recent years served as the Vice-Chair of the Linked Learning Alliance’s Research, Evaluation and Assessment (REA) Working Group. Her REA leadership coupled with chairing the Linked Learning Certification Design Team and Executive Committee played a role in a re-designed Linked Learning pathway certification process, inclusive of capacity building support with schools and districts, along with a continuous improvement model that was effectively piloted in 7 of the 9 districts from the California Linked Learning District Initiative. A final highlight, through collaborative leadership that included strategic partners Stanford’s Gardner Center, the Center for Powerful Public Schools and Oakland Community Organizations, Dr. McGlawn contributed to and led efforts that produced the Linked Learning field’s first ever framework for Integrated Students Supports. Dr. McGlawn’s field leadership has been invaluable as she embodies CCASN’s mission to build the capacity of educators and communities and to enact research-based strategies for student success now and in college, career, and civic life. The CCASN team looks forward to working with Dr. McGlawn to establish programs that will collect and disseminate evidence on student outcomes and exemplary practices and promote policies that make education fair and real.